The Toohey brothers, Irish immigrants James Matthew and John Thomas, started brewing Tooheys Black Old Ale in the 1860s in a brewery in Sydney. 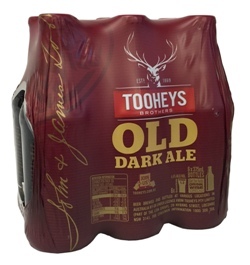 Tooheys Old pours an inky black, with an aroma of roasted malts. Tasting notes range from dark chocolate to coffee beans to dark fruits, and the finish is mildly hoppy. This beer is dark and very flavourful. Definitely the tastiest one we had in Oz. We are delighted to have found a way to get it here! A decent dark slightly fizzy beer,this was my drink in syd. great tast and smooth to drink! A decent dark slightly fizzy beer, europe do far better versions of this drop. But its not bad!